As well as another superb line-up of concerts at King Charles, we look forward to similarly high-class chamber concerts at nearby venues by our friends in neighbouring venues. Saturday 19 September: Music by the Bach Family, with Margaret Faultless and Rachel Stroud (violins) and Tom Foster (harpsichord). Saturday 10 October: "Evening in the Palace of Reason" - Johann Sebastian Bach at the Court of King Frederick the Great, with "Follia" (flute, violin, viola da gamba and harpsichord. Saturday 17 October: Carl Nielsen 150th Anniversary Recital, with Peter Arnold (piano) and Liz Partridge (violin). TWIMF is in full swing from 11 September with a jazz concert at Trinity, and including on Sunday 4th October the RTW Symphony Orchestra with Leonard Elschenbroich (cello) at the Assembly Hall Theatre featuring Dukas - Fanfare for La Peri; Dvorak - Cello Concerto; Holst -The Planets. Sunday 13 September: recital by James Noble (clarinet) and Simon Callaghan (piano) presented by CODA. 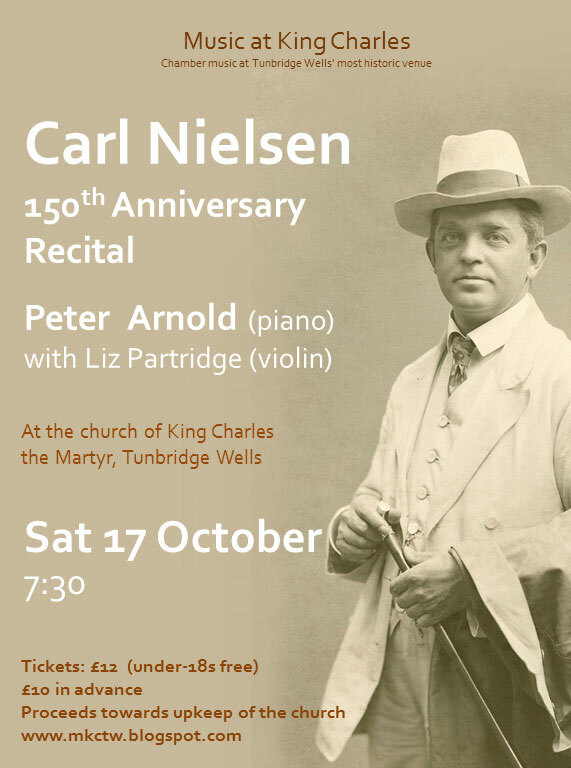 20-27 September: 'Music at Malling' festival includes a number of Bach Pilgrimage recitals, concluding with a Family Concert 'Nordic Myths and Legends' on Sunday 27 September. Saturday 26 September: The King Charles Singers present 'Music of the English Cathedral Tradition' at the church of St Mary the Virgin, Buxted. Friday 2 October: Jazz at the Oast presented by Beult Concerts.